French Farce, by Georges Feydeau and Maurice Desvailliere First Performed in New York Sept 23, 1895 at Hoyt's Theatre with EJ Phillips playing Angelique. Odette Tyler as Marcella and WJ Ferguson as Mt. Pinglet. NY Times Review Sept 24 1895 Gay Parisians at Hoyts "Mrs. EJ Phillips, as the wicked friend's over-mature wife, accomplished work that for a moment approached real comedy"
Odette Tyler (1869-1936) American actress and popular comedienne, was a member of the Madison Square Company for the 1884-85 season. Born Elizabeth Lee Kirkland in Savannah, Georgia. Her father went to West Point, but went with the South during the Civil War. Mrs. RD McLean Was she 15 in 1884 and acting in New York? How reliable is her birth date? EJ Phillips received a copy of her book for Christmas New York, 12-29-1895 Miss [Odette] Tyler her book, Boss [A Story of Virginia Life] and a pretty paper cutter. Lewis Strang in Famous Actresses writes of Odette Tyler that "her first professional appearance was made in 1884 in "Sieba," ... She was next engaged by Daniel Frohman for the Madison Square Theatre Company and made her debut in that house in William Gillette's The Private Secretary". Mr. Frohman then loaned her to Minnie Maddern... Charles Frohman next secured her as leading comedienne of the Empire Theatre Company. 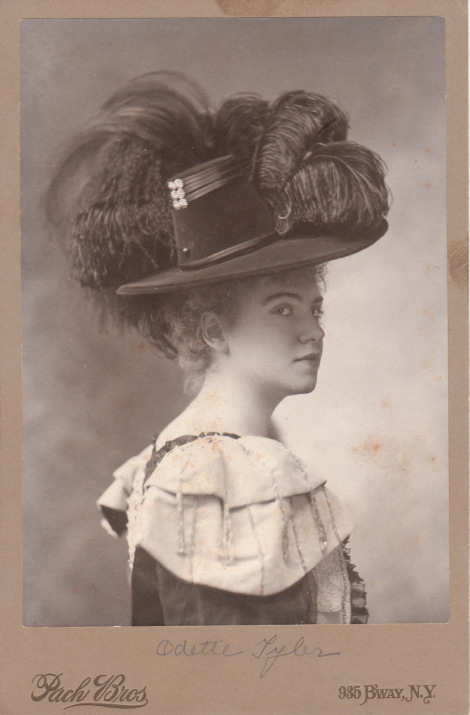 .. She originated the leading role in "The Gay Parisians"..
Sadie Martinot (1861-1923) [Mrs. Louis F. Nethersole] American actress, singer, played in comic opera in London and took leading roles in Irish drama with Dion Boucicault. Catalog of Dramatic Portraits. 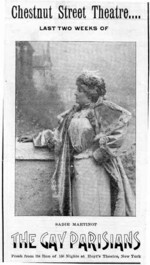 Married to Olga Nethersole's brother Louis and in the cast of the Gay Parisians 1897 playing Marcella, an architect's wife. Kansas City review A Chestnut St. Theatre, Philadelphia program lists WJ Ferguson as Joseph Pinglet, a master builder, Mrs. EJ Phillips as Angelique, his wife and Sadie Martinot as Marcella, an architect's wife. Joseph Humphreys is listed as the stage director. 51 East 21st Street New York August 30th, 1895 I have been kept busy rehearsing and studying ever since my arrival -- and the weather has been terrifically hot! We are to begin our play on the 13th but out of town! But I do not yet know where, and I think open in this city on the 16th. We are "going to try it on a dog" I suppose! I have not many dresses to prepare, and those not elaborate. Only two dresses -- one bonnet -- and a wrap. Am in 1st & last acts -- only three in the play. Mr. [William Jason] Ferguson is the only member of the Company I ever met. I know him very well. I have been rushed & will be until the play is produced -- still when words are familiarized I shall not have to work at home. If the play is a success I shall have an easy season, for the part is easy. I like my new stage manager Mr. Humphreys very much in that he is very thorough and energetic and puts on no airs. He has done more in three days with his play than the Hollands and Mansfield combined did in five weeks. We have no waiting at rehearsals. We begin on time and get through without any trouble. Best stage Management I have seen since Union Square days. 51 East 21st St NY 9-11 -95 Today it was rumoured, and I heard it was announced in some of yesterday's papers - that we open on the 19th in Buffalo, NY for three nights and Saturday matinee, and return to open on the 23rd at Hoyt's [Madison Square] Theatre for a run. Mr. Chas Frohman is attending rehearsals, is very pleasant and seems to be well pleased with the work of the company. The Genesee Buffalo Sept. 20, 1895 Well the agony is over and we still live. Opened last night to a full house and the play [Gay Parisians] went with roars of laughter. Guess it will be a go in New York. 51 E 21st N Y 10-18-95 Yes, our play continues to draw and no notice has been given us yet of its withdrawal. Did hear last night that they intended to keep it on for five months and perhaps longer, but that I rather doubt. But I think it will run into December. People are now taking about it and speaking highly in its praise. I met Dr Carew in at lunch yesterday in 47 [E 21st St]. He hadn't got over laughing then, he had seen it; Gay Parisians} Wed'day night. He was delighted with it. Mrs. DeYoung of San Francisco had just returned from Paris, where she saw the play several times, and was both surprised and delighted at our performance of it. Yes, our play continues to draw and no notice has been given us yet of its withdrawal. Did hear last night that they intended to keep it on for five months and perhaps longer, but that I rather doubt. But I think it will run into December. People are now taking about it and speaking highly in its praise. 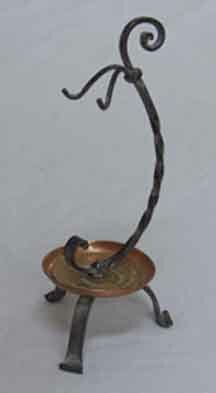 This is a rather odd-looking six-inch high black and copper colored piece I use as a postcard holder. The inscription on the copper colored circle read HOYT'S THEATRE, Monday Nov. 11, 1895, 50th performance, “The Gay Parisians". Art historian Saralinda Bernstein Lichtblau thinks it was a calling card holder, which makes sense. 6 PM [envelope dated Nov 18, 1895 postmarked NY] Well I was not asked to go to London, but to Chicago for a Summer Season, after this Season is over, which will not be for some time yet. The Summer Season will be for from ten to sixteen weeks at Hooley's Theatre, possibly beginning in June. So I accepted and think that will be better than going to London and perhaps getting lost in the fog. The manager of "Hooley's" has been on, seen our play, likes it and has been making arrangement with Mr. Frohman to have the Company play with him during the summer. 51 East 21st Street 11-26-95 We hear reports, but they are often changed or contradicted. I have heard that Chas Frohman is trying to place us in another theatre, in the City, on the 6th of January. I hope he will succeed, and that we shall not have to travel so early, but all is a mystery yet to us poor players. 51 E 21st St NY 11-29-95 By today's Herald I see that Chas Frohman is going to put John Drew in Palmer's Theatre on Jany 6th, and that I guess has given rise to the report that he was trying to get a theatre to put us in on January 6th, but I guess we will have to go to Brooklyn and Harlem and dear knows where! before getting to Boston when we are to stay for a "run" (4 weeks I guess). I hope that will not be before April for Boston is cold even then. 51 East 21st St N Y 12-29-95 [From] Miss [Odette] Tyler her book, Boss [A Story of Virginia Life] and a pretty paper cutter. … Next week I shall be in Harlem, and think I shall make arrangements to go up there to live. The following week Brooklyn. Then to Baltimore, Washington, back to Newark and then this City at Grand Opera House, one week in each city. Then an open, as yet, week and then Boston Feby 14th for a run for 5 or 6 weeks. This is what I have been told but then there may be changes. PARK HOUSE 86 & 88 Park Place Opp. Military Park H. Koellhoffer, Prop'r. Newark, N.J. Feby 7th 1896 I do not yet know where I can locate in New York. I am trying to find out about the "Chelsea House", 313 West 22nd Street. EJ Phillips doesn't seem to have ended up at the Chelsea House, but one of Ted Nickinson's daughters and family lived at 360 W. 22nd Street in the 1960's. The RUSSELL HOUSE Detroit, Mich. May 15th, 1896 What is the "Parada" and who teaches Ted to dance? I hope he made a success of his Debut on Wednesday Afternoon. I played Mrs. Pinglet [in Gay Parisians] that Afternoon in Toledo to a very bad house. I hope Ted drew better than his Grandma. The business has not been good since we left N.Y. Men, women and children are all riding bicycles in every town. No business being done anywhere in any line save bicycles! There never was such a general craze before. About 8 men and two women in our Company have their bicycles with them, and ride from 10 to 20 miles a day. Gustave Frohman is an enthusiast on the subject, and I think will kill himself overdoing the thing. TREMONT HOUSE Chicago May 21st, 1896 Should have enjoyed seeing [grandson] Ted's Terpsichorean achievements. His movements are so quick and light. He must have been a little fairy. Glad the Thrall Hospital accumulated so large a sum. We are doing well so far and the Manager of the theatre told me he was sure it would (the play) have a long run as he considered it much better than "Charley's Aunt" [by Brandon Thomas Oct 1893] which two years ago ran 16 weeks, and we are booked for only 12 weeks. TREMONT HOUSE Chicago June 3rd, 1896, We are still playing to good business. Monday night the management gave the receipts to the St Louis relief fund, $1000. I did not see a published account of it. It is time to go to shop. Tremont House Chicago, July 6th, 1896 I cannot tell you when you will see me. I think they expect me to go to San Francisco and along the coast. So I am cut out of your garden luxuries this Summer. I have not made any arrangements yet, but things look that way, and as long as I can work I want to do so. We are now in our eighth week and shall go through the stated 12 without doubt, but I do not think it will be extended to 16 as they proposed two weeks ago. Tremont House Chicago Il July 25th, 1896 Well. dear, on Monday night 7:30 I settled with Gustave Frohman (for Chas Frohman) for next season. Beginning in San Francisco August 17th. Leave here on Sunday August 9th, due in "Frisco on Wednesday and rest there until Monday 17th when we open at Baldwin Theatre for 2 weeks. Travel down the coast and up as far as San Diego and back up as far as British Columbia. Play in Victoria and Vancouver. Then back over the old road to Salt Lake, Denver &c until we reach Phila to play there four weeks. Tremont House Chicago, Ill July 31st, 1896 I have been pretty busy the past week getting things ready for my Summer trip to the Pacific Coast. I have a new gown ready for Mrs. Pinglet. We stay and give four more performances here the week after. Leave 6 PM Wednesday August 12th arriving, D[eo] V[olente], in Frisco on Sunday 16th, begin Monday night August 17th for the Winter Season. Wednesday noon August 12, 1896 All ready to leave the hotel for shop where we give the 100th performance in Chicago of Gay Parisians and go to train as soon after as possible. Well dear I am off for a long trip. If I can stand it, I will be improved by it, and whatever may come of it I do it for the best. The Baldwin San Francisco Cal. August 21st, 1896 Yesterday took a ride to the "Cliff House". Saw the ocean and found many changes and improvements (not in the ocean -- but on the land). New bath houses (there was no old one). A new Cliff House on the same site as the old one -- very much larger -- but looks too new in its white and red paint to belong to the picture. The ocean and Seal Rocks and the seals themselves look just the same -- but no doubt the latter have been changed many times in six years. But the present occupants of the rocks go through the same aquatic sports and jump on and off the rocks -- same as their ancestors. Barking is exactly the same. Our routes I sent to you have changed a little. We are here this week and next -- and on the 31st play in San Jose 1 night. Then to Oakland just opposite here on the 1st - 2nd and 3rd of September. 4th Stockton. 5th Fresno. On the 7th 8th and 9th Los Angeles. Then back to Sacramento for the 11th. 12th Marysville. 14th 15 & 16th Portland Ore, 17 Tacoma Wash. 18th Victoria B.C. 19 Vancouver B.C. 21 & 22nd Seattle Wash. 25th 26th Salt Lake City. 28th - Oct 3rd Kansas City Mo. Oct 5th - 10th St. Louis Mo. We are doing a good business. Telephone 222 P.O. Box 572 MANOR HOUSE Vancouver, B.C. Septr 19th 1896 [Saturday] We arrived here by boat this Morning at 9 o'clock, but I did not get up here to this hotel until 10:30. We left Victoria at 2 AM having gone to the boat after performance and went to bed, but the boat did not leave until 2 AM. We return the same way tomorrow. Going from here to Victoria, change boat there and go through to Tacoma, or else we would have to get off the boat in Seattle at 4 AM, not a pleasant hour but by going through we get an undisturbed nights rest and leave for Seattle at 9. Ride two hours on the water and get there at 11 AM Monday. Play there Monday and Tuesday and then turn our faces homeward. By the time this reaches you we shall be about leaving for Kansas City. Then I shall be over 1500 miles nearer to you. We had a fine house last night in Victoria. Arrived there 5:30 PM and boarded the boat at 12. Boat started for this place at 2 AM. Did not give me much time to get an idea of Victoria. I shall be glad when we reach Kansas City. Will have a few nights rest and hard travel will be over. OCCIDENTAL HOTEL Seattle, Wash Septr 22nd 1896 We arrived here yesterday about 11 AM. Had a foggy trip through Georgian Bay and Puget Sound. All the beautiful views of the scenery were lost. We have had fog ever since we reached Portland. We leave here at 4 AM for Portland, remain there for seven hours and then start for Salt Lake. Two nights or rather three, counting tonight on the train. I do not think the trains are as tiresome as the boat. We had to take three to get here from Vancouver, B.C. and all were propellers. And the pumping noise of the machinery was too tiresome for comfort. I suppose if I keep well, I shall not see any of you before December. Nearly five months since we parted, and what a lot of ground I have been over since then, and have still three thousand miles to cover before reaching you. T H E K N U T S F O R D G.S. Holmes Salt Lake City Sept 26th, 1896 "On Sunday Morning in Vancouver, BC Mr. [Daniel] Frohman invited me with three others of the company to take a drive in Forest Park, and a more beautiful drive I never enjoyed. The grand old trees & the water views were beautiful” Was Forest Park Stanley Park? It certainly is a forested park, long logged with "monumental" trees. It is four thousand miles from Vancouver to New York. Perhaps you didn't know I had been so far away. Last night Mr. [Gustave] Frohman came behind the scenes very much elated over a letter he had rec'd from his brother Charles [Frohman] saying that in May next he was going to send Gay Parisians and Too Much Johnson to Australia. The Company would start out from New York in May and be back in November. Did not exactly ask me to go, but was doing all he could to get my ideas about it. I do not see much money in it for myself. There would be ten weeks at least going and returning, without any salary and under heavy expenses all the time. I think in the end I would be paying for the privilege of playing. And it would pay better for me to watch Albert's garden "sass" [home garden] grow and help to eat it when it was ready next summer. I hear of no change in the route, but go on just as you have it. Beginning with Decatur, ill on the 12th and one night stands to follow until Omaha, Neb where we play three nights beginning on 22nd of Octr. The NEW COATES Kansas City, Mo Octr 1st 1896 Leave here Saturday night for St Louis. Give 10 performances there beginning with Sunday night the 4th and ending Sunday 11th with two Matinees thrown in. Real pleasant. It will be State Fair week and Carnival time. What is troubling us is where we shall be able to find shelter. The City is expected to be over- crowded. We play at a new theatre named "The Century". Frohman's Empire Theatre Stock Co are playing there this week. We shall be the 2nd attraction. I sent you a paper with notice yesterday and enclose another notice in this. Very good for the "old lady"
The review from a Kansas City newspaper opens "French farces are much alike: you laugh at them until laughter becomes painful, and afterwards you wonder what was the cause of your mirth. The Gay Parisians is very funny much while you look at it, and very trivial after you have left the theatre. It has the usual number of persons who meet in a hotel and do not wish to be seen by each other...The story is of a woman who wishes to make her husband jealous. She goes to the theatre and afterwards to supper with another man, and after numerous recognitions the police raid the hotel ... It seems to a pity to waste so much good acting on such light material"
Sturtevant House Broadway & 29th Street New York Jan 9, 1897 Last night, our route was announced for the next two weeks -- we began to think they were going to close down our season. We go to Wilmington, Del next Monday the 11th of Jany, 12th Lancaster Pa, 13th Harrisburg Pa, 14th Trenton NJ, 15th Easton Pa, 16th Scranton Pa on the 18th Newark, so if Albert is busy this week, perhaps it will be easier for you & him to come to Newark -- than to come here this week. Please yourselves. Baman says we are not to take the New Orleans trip - and Australia is now doubtful. So we are quite at sea for the present as to our future. [But EJP was in New Orleans in March 1897] I have no Matinee today! And I am happy. Such a treat! Only seven performances this week instead of nine or 11! I have not been out since my arrival except to go to the shop. EJP didn't seem too enthusiastic about boat travel, so not going to Australia may not have been too big a disappointment. The Zavistowskis (Aunty Christine, and daughters Emmeline and Alice) had toured Australia in 1872 and Aunty went back in 1874. T H E L O C H I E L Forrest Hunter Harrisburg, Pa. January 11th, 1897 I left the Sturtevant at 7 Sunday Morning, got to Hattie's before 12 and at 3:15 John, Jack and Hattie escorted me to Broad Street Station to take 4:30 PM train with Gay Parisians Co for this place where we arrived last Evening at 7:25. I will now try to write to you a history of my proceeding since Providence. We went to train after performance on Sat night -- reach NY after 7 AM. I took a cab for DesBrosses ferry -- crossed to New Jersey in time to take 8:30 train for Phila, got there at 11:50. John, Jack and Hattie took me to Broad St. [Philadelphia] station. The train from New York was due there 6:47 -- Mr. Zack, our new business manager met me at the gate, and I left John, Jack and Hattie there, looking after me through the bars. Charlotte is a very pretty place, and I find myself in the hotel where Mr. Kirby died - and have talked with the colored boy who worked for him five or six years - He asked about Lizzie and Fannie. I had no idea of coming to this house and finding it to be the hotel the Kirbys had lived in so long or finding anyone they knew. We start at 1:30 in the morning for Asheville NC -- get there 3 PM. Next Morning start earlier for Knoxville -- have a change of cars and get there late in the afternoon. But Mr. Zack has told me that after that - the trips will not be so hard. They are as follows Knoxville, Tenn., 18th Chattanooga, 19th Birmingham, Ala 20th, Macon, Ga 21st Sunday, 22nd Savannah, Ga 23rd Charleston SC, 24th Augusta Ga, 25th & 26th Atlanta Ga, 27th Pensecola, Fla [sic], 28th New Orleans for a week. March 8th Cincinnati Ohio, 15th Phila, 22nd Harlem. This is all I know so far. I have heard we go to Buffalo and Chicago again -- but not officially. Guess we will close about 1st of May. Have had some heavy traveling and loss of sleep. Left Asheville after performance last night at 1:30 AM. Got here at 4:45 AM. Went to bed soon as I got my room in the above hotel, and have remained there until 4:30. Am now dressed & ready for supper. We leave after performance tonight at 4:30 in the morning. Get to Chattanooga at 11. Give a matinee at 2 and night performance. Then leave for Birmingham, Ala but exactly when I cannot say - but the untimely hours and loss of sleep - and the extra matinee rung in on us. Em Chitty lives in Knoxville and I have visited her there several times. Left Savannah this morning at 5:50, reached here about 11. A lovely day, just warm enough to enjoy walking. I went out to the Battery - rode out in street car and walked back - the sea breezes felt lovely. We leave at 7 in the morning for Augusta. Play a mat[inee] and night there and then to Atlanta for two nights - on Saturday night Pensacola - Monday 1st of March New Orleans where the long season of Gay Parisians closes Sat night March 6th. Such was the order of Chas Frohman put up on call board last Evening. It was rather a surprise, for we had been told we were to play in Cin'ti, Phila and Harlem after leaving New Orleans - but Charles has changed his mind and we go straight through to New York, or where we want to go. I shall go to Phil[adelphia] to mend my clothes and get rid of my clothes and trunks. Mother and I were both excited to find that EJ Phillips had been to Pensacola, Florida, where grandson Ted ended up after going to Annapolis, serving in the Navy and marrying Em Turner Merritt. Albert happily spent a number of years living down the street from them, fishing in Pensacola Bay and gardening, though Neppie spent most summers in Middletown (and most of 1938 for which we have Albert's letters recounting what was happening in her absence). Atlanta Constitution Feb 24 1897 The attraction at the Grand Thursday and Friday will be "The Gay Parisians," with the original company which was seen for 200 consecutive nights at Hoyt's theater, New York, followed by long runs in Boston, Philadelphia, Chicago, Manager Charles Frohman sends here also the entire original scenery used in the New York...Feb 25 An amusing farce is to be seen at the Grand tonight and Friday. It is "The Gay Parisians," a comedy which Manager Charles Frohman has presented with great success in New York, Chicago, Boston and Philadelphia, with probably one of the most excellent companies that has been seen in farce for many years. Feb 26 The patrons of the Grand were treated to a clever farce comedy production last night in "The Gay Parisians." All the parts were well cast and the play was one of the most amusing seen here this season. EJ Phillips has connections with New Orleans in the 1870s through Ben DeBar and Lawrence Barrett. I was so tired on reaching here Sunday Morning and playing Sunday night that I had to put off writing until today. Great time of Mardi Gras is in full blast and processions and Balls & are all that people are thinking about. We have had two big houses, but the fun ends tonight and the Fast begins tomorrow. Then we may not do as well. I have had very hard work for the past two weeks, but this week will not be so hard, only two Matinees, and no travel. We leave Sunday Morning and are due in Phila & New York Tuesday Morning, thus ending the long run of Gay Parisians. I feel that I need a rest and am not sorry -- much as I dislike to lose my salary. After John Nickinson died in 1864 EJ Phillips was for some years a member of the famous stock company Ben DeBar [History of the American Stage} at St. Louis. She went from St. Louis to New Orleans to play old lady parts at the Varieties Theatre, the leading stock theatre at New Orleans, under the management of Lawrence Barrett (1838-1891). Ben DeBar (1812-1877) had been "stage manager for Noah Ludlow and Sol Smith at the St. Charles Theatre in New Orleans, when they retired in 1843 he assumed management of their New Orleans and St. Louis theatres. St. Charles Theatre, New Orleans, LA http://cinematreasures.org/theater/3200/ First opened 1830s, burned 1842. Rebuilt a year later, burned 1899. This 1897 trip to New Orleans seems to have been her first for many decades. Carondelet Street is about 8 blocks from the Mississippi, and considerably south of the French Quarter. The Gay Parisians appeared at the Varieties Theater, on Canal Street, which would seem to be the same one Lawrence Barrett managed in the 1870s. I first went to New Orleans in 1989 and have been back several times, including one trip when Interview with a Vampire was being filmed in the French Quarter where I was staying, with straw covered streets and carriages. Haven't been back since I've learned more about EJ Phillips career in New Orleans from 19th century newspapers, and not sure how much more I could learn, but would always be up for a good reason to go to New Orleans. 1896 1 13 1 week Brooklyn NY Gay Parisians to Newark and NY Grand Opera after Wash? 1896 1 20 1 week Wash DC Gay Parisians and Baltimore? 1897 1 13 Harrisburg PA Grand Opera House Gay Parisians Hunter?